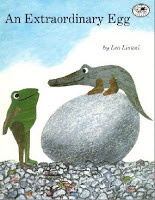 An Extraordinary Egg is a very cute story about three frogs who find a wonderful egg, thinking it must be a chicken egg they are excited to have a new friend when the chicken hatches, even though it’s really an alligator! Kids love this story because they think these are the silliest frogs ever for not knowing that the chicken isn’t a chicken at all! Fish Is Fish is a cute book that not only talks about friendship but it also explains the transformation of a tadpole into a frog in an entertaining way. 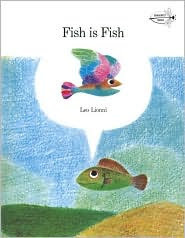 I have used this book in classrooms while doing animal life cycles and kids always love how the fish in the book imagines people as fish with legs! The story of friendship between the little tadpole and minnow can’t be ignored either; it’s a great message about change and the way friendships if true can withstand change. 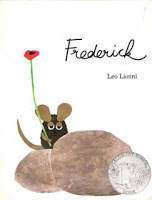 Frederick is a fable about the importance of imagination. When all the mice are working hard to gather things for winter Fredrick is quietly taking in the sun, and colors they will need to help get them through the dark, cold, hungry days ahead. The other mice don’t see why this is so important until everything they have gathered runs out and they need Fredrick and his imagination to help them make it! Great commentary about art being vital. 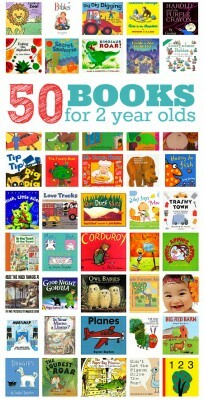 Your toddler may not pick up on that but you will! It’s Mine! 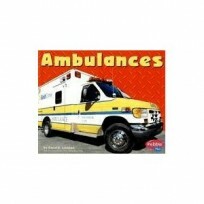 is one of my favorite books to pull out when I hear those words… which I have recently. The story is about three frogs who all live on a small island, and fight all the time. They take turns claiming this or that never sharing with each other. When a flood comes, they learn that they need to rely on each other and share to survive. After they learn their lesson, they see that the island is a happier place to be when all their energy isn’t spent fighting and screaming “It’s mine” to each other. 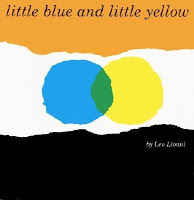 Little Blue and Little Yellow is a profound book with underlying commentary about race relations while the surface story is about little blobs of color who when squished together turn into one green blob! You’ll be surprised by how easily your preschooler will pick up on the connection between the two. In my PreK class, I had more than a few kids make the connection all on their own. 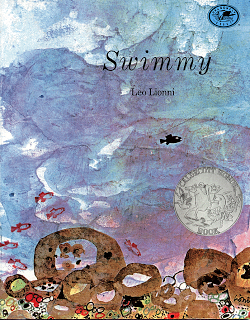 Swimmy is a serious tale about a little fish who tragically looses his family, and is forced to face scary things alone. He soon discovers that if he and other little fish band together they have power against the big bullies in the ocean. Personally I love this author and this book is one of my favorites. Some parents have expressed concern over his family being eaten at the start , so read it for yourself before deciding if it’s right for your child. The Alphabet Tree is a stunning book. The book is all about letters that come together to make words and then after a caterpillar informs them that they need to say something they join together to make sentences. Up to this point the book is a brilliant teaching tool , but for me the best part is yet to come. When the words get together they decide to say ” Peace on earth goodwill toward all men” and then the caterpillar asks them to jump on his back so he can take the words to the president . Considering it was written in 1968 it’s quite the statement. A fantastic activity to do with your child after reading this would be to ask them what they would write to the president ? For younger children using letters on leaves you could spell out easy 3 letter words like they do early on in the story. All in all a brilliant book. Questions for you…I'm sure you've done it before, but would you point me to a post or post or just share with my your top favorite authors for 2-3 year olds? Ohhh Annette that's a great idea if you can wait a week I would love to do that next Saturday? What do you think ? These look great. I'm definitely going to check out Little Blue and Little Yellow! I see a companion do-a-dot activity coming on. I read your post in google reader, then scrolled back up to see whose post it was. I should have known it was yours – I always love your book suggestions. We LOVE Leo Lionni. Swimmy and Little Blue and Little Yellow are two of the most read books in our house. We used Swedish fish to make our own Swimmy picture! We love "A Color of his Own" (my 2.5 year old daughter and me)by the same author… Have you checked it out?? It is about a chameleon who longs to have a color of his own, the story is really nice and of course has a very happy ending, it is about friendship… Hope you like it when you read it!! 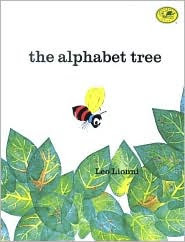 We love Leo Lionni too… but I've never read The Alphabet Tree, and based on your review I've ~got~ to check it out! Thanks! We love "Color of your own" too I have added it to posts here before but never wrote a full review. Back in the early days of NTFFC I only added titles and no reviews. I think I will be adding it into a post about colors or chameleons soon. It's a great one for younger children/toddlers because it's not as long as some of the other Lionni books and is widely available in a board book verison. Lynn and Christy those are both great ideas! I can't believe I've never seen these before – they look right up our alley with the emphasis on friendship, collaboration, and peace. Thank you for the reviews! I'm off to request them from the library.